By Jason Kim: 46-year-old Bernard Hopkins is no longer satisfied with trying to have his fight from last weekend against Chad Dawson changed from a 2nd round TKO loss to a no contest. 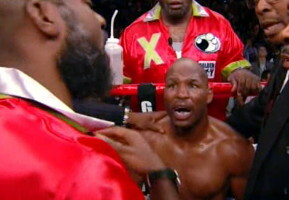 Hopkins now wants the results to be changed to a disqualification win, as Hopkins feels that Dawson intentionally knocked him down when he snatched Hopkins’ left leg and lifted him off the canvas before letting go, leaving Hopkins to fall backwards onto the canvas where he injured his left shoulder. An x-ray was done on his shoulder and it reportedly showed that Hopkins suffered a dislocated left shoulder. Hopkins will keep his WBC title whether Dawson is disqualified or the fight is changed to a no contest. Trying to prove that Dawson was looking to hurt Hopkins when he bucked him off of his back is going to be hard to do, and I really can’t see the California Athletic Commission making that kind of ruling. At best, they’ll overturn the result and make it a no contest. Hopkins can then move on and look for someone else to defend his title against. Dawson is already targeting Jean Pascal for a fight that would take place possibly in December. If Hopkins wants to fight Dawson again he’s going to have to make him a big offer, because he’s got other targets. Hopkins really needs to fight Dawson again because Hopkins looked the worse of the two fighters and he has a lot of proving to do.